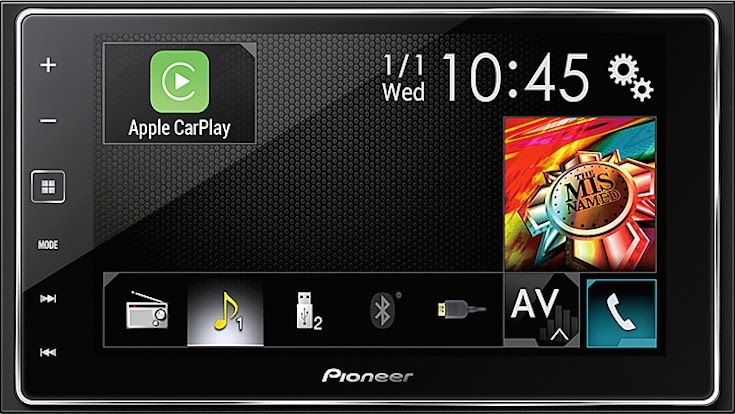 Pioneer Electronics' AppRadio line has undergone a gradual transformation over the last few years. The previous generation models had modest improvements over their predecessors. The AppRadio 3, for example, came with Bluetooth streaming and a CD/DVD drive along with a slightly faster interface. The recently announced AppRadio 4 (SPH-DA120) however, takes upgrades to a whole new level over the AppRadio 3. And I'm not talking about Apple CarPlay alone. Yes, that's a big addition but there are a whole spectrum of other features that will make the device one of the highly desired head units this holiday season. We have been testing out the AppRadio 4, which was sent to us by Pioneer Electronics, for a few days now, and this is our full in-depth review. For full technical specifications of the device, check out this link. Also, read our unboxing and installation experiences which we posted last week. Those won't be covered in this review. In this review we will look at the features that make this device the best AppRadio yet and find out how the AppRadio 4 rivals higher end head units in certain aspects. Back in 2011, Pioneer introduced AppRadio Mode (which was called Advanced App Mode at the time). AppRadio Mode brought smartphone apps to your dashboard in a unique way. By connecting your smartphone (iPhone and later select Android phones) to the head unit, you could utilize app functionality in a new, made-for-the-dashboard interface. AppRadio Mode has gained traction over the last three years with over 35 smartphone apps being compatible through iOS and Android. But the technology had its problems. Caution screens and warning messages popping up, screen resolution issues, calls over Bluetooth issues and so on. Although some issues were fixed with firmware updates, others still persisted. Even to this day, AppRadio Mode works sketchily. With every iOS update, new problems cropped up. Currently in iOS 8, AppRadio Mode has the screen resizing issue that plagued devices last year. The issue was fixed in iOS 7, but has returned this year. Resizing makes the display look smaller, leaving dead space on all sides. It does get a little annoying at times. But AppRadio Mode is still the best smartphone app integration available in terms of the number of apps it supports. No other platform supports over 35 smartphone apps. The AppRadio 4 includes AppRadio Mode but that is probably one of its lesser features. In fact, after reviewing the device, we wonder whether the AppRadio 4 should have been called an AppRadio after all. Yes, it is technically an "AppRadio," but it could have well been called an AVH-3000NEX and no one would've complained. More on that later. The first thing you'll notice when you turn on an AppRadio 4, is the smaller 6.2-inch screen compared to the 7-inch AppRadio 3 and AppRadio 2. But the buttons on the device are now digitized and flush with the screen. No more button bar that stuck out like a lip on previous devices. Actually, the flush buttons on the AppRadio 4 make the screen look bigger than it actually is. The touchscreen is capacitive, like previous generation AppRadios but unlike the lower end AVH-4000NEX which features a resistive touchscreen. Capacitive touchscreens are often more responsive and are similar to the ones found in most of today's smartphones. The screen resolution is 800x480 pixels. 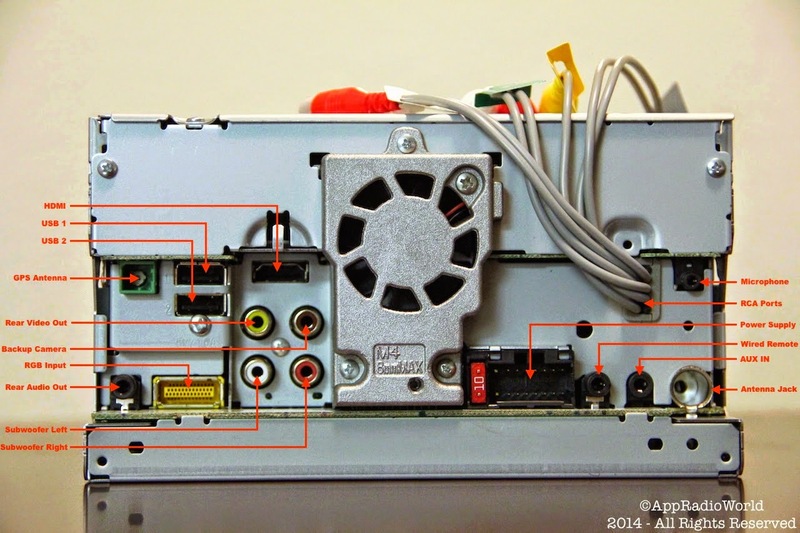 The connection ports on the back of the unit include HDMI, two USB ports (one for CarPlay and firmware updates, one for Android connectivity), AUX in, three RCA preamp outs, and a backup camera input in addition to the standard ports (mic, antenna, GPS antenna, wired remote). Right out of the box, the AppRadio 4 comes Apple CarPlay-ready. You don't need to install any firmware updates to enjoy CarPlay (like in NEX head units) even though Pioneer released a firmware update last month that fixes a few bugs. CarPlay is the most sought-after technology for the car these days. The software has made a huge splash since it was announced by Apple last year. New car models from various manufacturers will offer CarPlay by the end of this year and throughout 2015 but for the car you already own there are way cheaper Pioneer and Alpine options. AppRadio 4 is the sixth Pioneer head unit that brings CarPlay to consumers to go along with the five NEX receivers. And CarPlay works quite well on the device. There are a few issues that will have to be ironed out by Apple, but for now the AppRadio 4 is the least expensive CarPlay option out there. With CarPlay, you can use an iPhone 5 or later running iOS 7 or later which connects to a compatible head unit like AppRadio 4 via a USB connection. CarPlay puts commonly used iOS functions like Phone, Messages, Music, Podcasts and Maps on a familiar interface in your dash. In addition, a growing list of third-party apps are accessible. Siri helps access all those functions safely. Let's talk about NEX for a moment. Pioneer announced NEX or Networked Entertainment eXperience head units at CES 2014 early this year. Five high end devices were announced which offered connected features like AppRadio Mode, MirrorLink, and Pandora and also built-in navigation in four of the five. The best feature of NEX though, is the interface. The new and improved interface is fast, neatly arranged, and easy to navigate. With NEX, users can go through their media sources with ease. Toggling between modes is very fast. You can go from HDMI/AUX mode to CarPlay by simply tapping a button! The AppRadio 4 features a 13-band graphic equalizer which allows better sound tuning over the 5-band equalizer in the AppRadio 3. The three RCA preamp outs are also a nice upgrade (compared to two in the AppRadio 3). In addition to this, the device is now capable of playing lossless FLAC audio files from a USB drive. The only drawback is there is no optical audio out which would improve sound quality even further. Other sound features include digital time alignment, crossover adjustments with High Pass and Low Pass filters, and listening zones. Pioneer's Auto EQ feature allows you to find the best sound settings for your specific listening environment. Unlike in previous generation AppRadios, you can now browse through your music library over Bluetooth. Browsing right from the root directory means you have access to all your playlists, artists, songs, etc. in folder format. This is a very good feature added to Bluetooth connectivity. While those were some of the features of the new AppRadio 4, there are a few issues we have to mention and some improvements that may be coming soon. 1. AppRadio Mode: As mentioned above, AppRadio Mode still has plenty of issues. First and foremost, if using an iPhone 5 or above, you will still need the bulky HDMI/Apple Digital AV Adapter/USB Cable connection to use AppRadio Mode. We have written about these messy cables before and how you can reduce the clutter by using a lightning cable extension like a CableJive dockXtender. Secondly, the screen resizing issue in AppRadio Mode looks far from being resolved. This seems to be an issue that Apple needs to fix (they had it fixed partially in iOS 7). Thirdly, a lot of third-party apps that are AppRadio Mode compatible are slowly being updated to add iOS 8 compatibility. Many apps had crashing issues due to a keyboard problem in iOS 8. While some apps have been updated with a fix, many still remain unusable in AppRadio Mode. AppRadio Mode has fewer problems when used with an Android device. Screen resizing is not a problem here. But Android connections also require different cables depending on the device which can look messy. 2. CarPlay: Like AppRadio Mode, CarPlay has its own share of problems right now. Graphics issues have been reported when using the software. For example, one user sent us these pictures showing the menu bar floating in the center of the screen. The fix is simple though requiring a restart of your iPhone. Another display issue we found was the CarPlay icons clumping up towards one side of the screen. Even the keyboard was shifted to one side. This issue was also fixed by restarting the iPhone. There is also a slight lag we found when triggering Siri. It takes her a few extra seconds to get ready to receive commands. Also, Siri won't launch any apps for you, instead will reply by saying "I'm afraid I won't be able to help you with that while you are in your car"
CarPlay is an iOS feature and most issues are not to be blamed on Pioneer. Apple is responsible for those fixes. The software is still new and improvements will happen with newer versions of iOS. 3. Switching Between Modes: Although we mentioned switching between modes is fast on the AppRadio 4, you cannot switch between CarPlay and AppRadio Mode on the fly. Simply because the connections used are different for the two modes. Switching requires changing the cable connection as well as the setting in the smartphone setup menu making it difficult while driving. So make up your mind between CarPlay and AppRadio Mode before you get moving. 4. Glare: Although this doesn't seem like a big deal, the smooth and reflective capacitive touchscreen display of the AppRadio 4 can be very hard to see on a bright and sunny day. Resistive touchscreens have that advantage here by being less reflective. Maybe an anti-glare screen protector would be a good idea. CarPlay should be all you need to hear about to go out and purchase this device. As we've mentioned, the AppRadio 4 is the least expensive CarPlay option available at the moment. The software works quite well despite a few issues. If you're getting directions through Apple Maps and press the home button within CarPlay to go to the CarPlay menu, your navigation instructions are displayed at the top of the screen. Also, a small maps icon is added to the menu bar allowing to to quickly return to Maps at any time. I found this feature very useful at many times. Siri has received marked improvements over the last few months and aids in navigating through the CarPlay interface with ease while keeping safety in mind. And, you can use the "Hey Siri" command (if enabled in settings) to trigger Siri at any time while your phone is plugged in. The picture quality on the AppRadio 4 is very good. Colors are vibrant and theme animations in NEX mode are smooth. Themes are highly customizable allowing users to choose from the whole spectrum of colors to backlight the buttons. You can also customize backgrounds, clock fonts, and illumination. Call quality was also very clear when using Bluetooth or in CarPlay. Apple Maps work great in CarPlay. The "Destinations" list saves your most recent locations/addresses and also automatically picks up addresses from your text messages. Route information is also available allowing you to choose between different routes to a particular destination. Pandora now allows users to create stations on the head unit itself. This station creation feature was absent in previous AppRadios. Bluetooth streaming works well too. Say goodbye to warning screens and pop-ups when using Apple CarPlay. Unlike AppRadio Mode on previous generation AppRadios, CarPlay works seamlessly. You can even toggle in and out of CarPlay without having to click through safety warnings. The only safety message you receive is when you first start up the device. AppRadio Mode still requires the handbrake to be cycled to work. CarPlay, on the other hand, doesn't. So CarPlay has a clear advantage here giving users a pop-up free experience. Also, when playing a sound source like music from your smartphone, there are no interruptions if you switch modes between CarPlay and NEX and vice versa. Previous generation AppRadio users will be familiar with switching sources and how the music playback would get interrupted. The overall experience on the AppRadio 4 is very streamlined. You do have to unlock your iPhone for CarPlay to work the first time you connect your phone to the head unit though. Once CarPlay launches, you can go ahead and lock your phone and it won't interrupt your interface on the head unit. When switching between the different CarPlay functions like Messages, Music, etc., the iPhone launches the corresponding app without any "App Launch Warnings" or pop-up messages. We absolutely love the new AppRadio 4 and fully recommend it as an upgrade or if you simply want to enjoy Apple CarPlay in the car you already own. Compared to previous generation AppRadios, this year's model is a marked improvement. CarPlay will continue to advance and add other third-party apps to its repertoire. Since CarPlay is Apple's creation, the Cupertino company will continue to have full control over its features, fixes and improvements. Issues that exist will have to be fixed by Apple themselves, not Pioneer. The NEX interface is also a winner in our opinion. The fast, easy-to-use interface doesn't take too much time to get used to and the AppRadio 4's capacitive touchscreen does a great job of minimizing delays or lags. In comparison to Alpine's recently announced iLX-007, we feel the Pioneer AppRadio 4 is a clear cut winner at this point. Although both devices offer CarPlay, Alpine's head unit lacks many features that the AppRadio 4 offers. The iLX-007 does CarPlay and CarPlay alone (not even Bluetooth streaming), whereas the AppRadio 4 offers robust connectivity options with iOS and Android compatibility, HDMI connectivity, Bluetooth streaming, etc. We will continue reviewing the AppRadio 4 and report back with any new issues or feature details we run into. So keep checking back for the latest. Thanks for reading our review. When in AppRadio mode, the apps now only get a portion of the screen, as there is a left menu. Can this be hidden so that the apps get full screen? Yes, you can! Double tap the home button (the grid button) to switch to full screen. Great site. Love the review. I ended up getting this stereo and love it. My only question is when using carplay and playing music the artwork displays behind the text but it is very dark. Is there anyway to brighten the screen so you can actually see the artwork? Thank you! hi, how to set the clock on this product please ? how to set the clock please on this product ? how do you change the background image by using a usb? i tried and it didnt work. One question can i connect an iPhone 5S or 6 on USB 1 or HDMI and connect a iPod on the second USB poort, the iPod is just for music playback and the iPhone for carplay. I was trying to connect my new phone to Bluetooth but I get an error message saying "memory full" how can I make space? Delete at least one paired phone on your head unit under Bluetooth settings. hi, do wrong to update and restarting the unit is not, it is possible to fix? Its reset the machine and installing new program? screenshot captured by iPhone in carplay mode ? for example on NEX5000 (6.1" display) the screenshot captured by iPhone measured at 902 x 472 pixels.